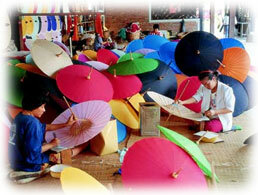 Chiang Mai is perfect for exploring northern Thailandโ€�s traditions and culture. Doi Suthep Temple, one of Chiang Maiโ€�s must-visit, is very sacred as its Lanna-styled golden pagoda enshrines several Buddha relics. Its perch on top of a mountain gives a panoramic view of Chiang Mai. Meo Tribal Village offers an insight into the culture and ways of living of the Hmong hill tribe while Bo Sang Umbrella Making Village gives demonstrations on making Sa paper umbrellas made from the bark of mulberry trees. Donโ€�t miss the shows at Mae Sa Elephant Camp that showcase the elephantsโ€� skills in hauling logs and playing soccer and the opportunity to trek through the jungle on elephant-back. Enjoy a traditional Kantoke dinner while watching traditional northern Thai dances before hunting for souvenirs at the Night Bazaar. Book one of our Chiang Mai hotels now for a truly marvelous time. The Eurasia hotel is located 10 minutes far from Chiang Mai night shopping Night Bazaar, hotel provides shuttle bus to down town every hour. Driving 20 minutes away from the airport and 5 minutes from train station. The Lotus Pang Suankaew is located next to the Chinag Mai Orchid Hotel and adjacent to the Kad Suan Kaew shopping plaza and Kad Suan Kaew Theatre. A 10 minute drive away from the night bazaar. Situated right next to Chiang Mai's Tapae Gate, one of Chiangmai's most famous entrance gates. Distance from Chiang Mai airport takes approximately 10-15 minutes and within 5 minutes walk to Chiang Mai town. The Orchid hotel is located on Huay Kaew Road next to the central department store and the Kad Suan Kaew Theatre. The hotel is about 10 minutes by taxi to the night bazzar. The Imperial hotel is located in the heart of Chiang Mai behind the night bazaar. The Royal Princess hotel is located in the heart of the night bazaar. The Ayatana Hamlet and Spa hotel centrally located in the city of Chiang Mai near Chiang Mai University. It is within 15-20 minutes drive from Chiang Mai International airport. The D2 hotel is right opposite Night Bazaar, the main shopping area in Chiang Mai down town and 20 minutes away from Airport. Hotel Chedi is located right next to the Night Bazaar the main shopping area in Chiang Mai, and the hotel is facing the magnificent Mae Ping River.